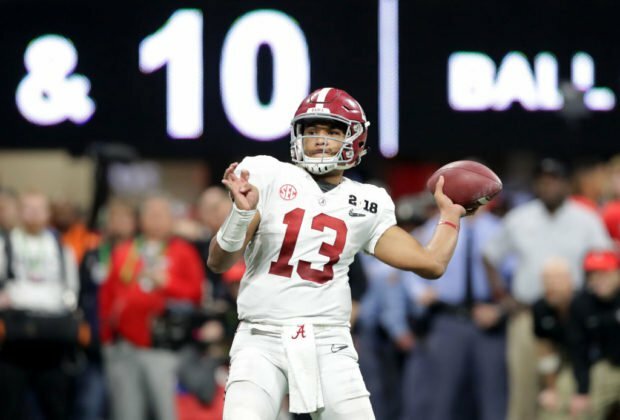 Tua Tagovailoa is quickly becoming a popular name in sports for pretty much single-handedly winning the football game for the Alabama Crimson Tide over the Georgia Bulldogs on Monday night. He wasn’t the starter in any game this year, but the freshman from Hawaii wasn’t at all bothered by this. He ended up throwing the game-winning touchdown in overtime, but that isn’t why people should recognize him. It’s what he said after the game that really won our hearts. He was asked what he was thinking when the coach told him that he was going to start this game. The answer? Nothing short of awe-inspiring. He thanked his family and teammates before continuing his heartfelt speech in honor of the Lord. In a time where football players seem to be, for the most part, against everything the country stands for including God, this is a refreshing change of pace. To see a young man who clearly loves God and has accepted His role in his life succeeding in his passion is definitely a great thing. This will probably upset a lot of people who think that religion should be confined to churches and individual homes, but they fail to see the importance that religion and faith has to a lot of people. They don’t understand that it’s not just something to hear about for a couple of hours on Sunday before you go home, crack a beer and watch the game. It is a guiding principle that people carry with them everywhere, and it is something that defines their actions and behaviors throughout the days, weeks, and years of their lives. It’s nice to hear a young man praising the Lord for his successes instead of letting it go to his head and become egotistical. We see so much of that these days, but it does my heart good to know that there are people who can recognize that there is something out there larger than themselves and it is helping them become better.